A few weeks back we went on a road trip from Cork to Donegal and back – covering 16 counties in all. When we came back we wrote up a number of posts in our weekly newsletter (see the side of this post if you want to sign up for free) – and these were some of the MOST popular newsletters we have done so far. This is Part 4 of our Roadtrip ( you can go here to see Part 1, here to see Part 2 and here to see part 3). This week on our road trip around Ireland, we move to the counties of Cavan, Longford, Westmeath, Offaly and Tipperary (phew!). 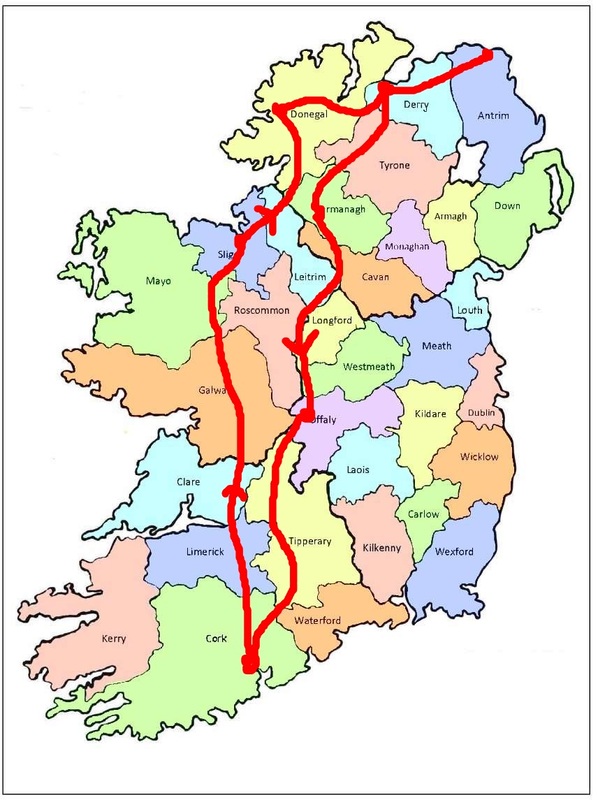 So, we’re going to finish our roadtrip around 16 counties of Ireland. You can see a map of the journey above – and do leave a comment at the end of this blog post! As before, we’ll stick with the stories of the counties – the names and families associated with each. Do your families come from any one of these counties? We crossed the political border from County Fermanagh into Count Cavan one bright Sunday morning. It was a quiet day on the roads. One of the things you notice in Cavan is that the horizon is never more than a few hundred yards away, making the countryside feel local and intimate (a bit like “middle earth” from Lord of the Rings – ok – I’ll stop the LOTR references now!). We are now in O’Reilly country! In ancient times, the area of Cavan was part of the kingdom of East Bréifne (also called Breffni O’Reilly after the ruling family). In fact, the county is still often referred to as the Breffni County. Historically, Cavan was part of the western province of Connacht, but was transferred to Ulster in 1584 when Bréifne was shired (Leitrim to the west – Cavan to the east) and became the county of Cavan (an Chabháin which was named after the town of Cavan). The plantation of Ulster in the early 1600s saw several new towns such as Cootehill, Killeshandra and Virginia being built – and they still have a “planter feel” today. This is a county in the modern republic where you see a heavy influence of those plantation times – a lot of English and Scottish settlers moved into the county and established a prosperous flax and linen industry. O’Reilly, however, still remains the single most common name in the county. Is your family name here? When I was growing up – Longford had a real reputation as a Republican county. And when you look at its history you see a centre for the rebellion of 1798 (when the French expeditionary force were defeated outside the village of Ballinamuck on 8 September by the British army – leading to massive reprisals being inflicted by the British on the civilians) and a key county for activity in the Irish war of Independence. Longford has had a harsh past – losing almost one-third of its population between 1841 and 1851 to starvation and emigration. Like many counties in Ireland – this “drip” of emigration continued all the way to the late 20th century – by 1986 the population was 25% of the 1841 population. This county area was traditionally known as Anghaile in and formed the territory of the Farrell clan. The county was created in 1564, taking its name from the principal town, “Longfort Uí Fearghail” which translates as “O’Farrell‘s landing place”. The association of the area with the O’Farrells goes back to the 800s and despite the arrival of the Normans in the 1100s, the O’Farrells ruled until the the seventeenth century, when a limited plantation of English settlers took place. As we crossed from County Longford into Westmeath – we headed off in the direction of the mighty River Shannon, which forms the western border of the county. Specifically towards the town of Athlone. County Westmeath covers what was the northern part of the province of Mide (which literally means “middle”) – and was known as Teffia. This area always had the the Gaelic Irish chiefs in the driving seat (apart from brief interludes) – among them the McGeoghegans, O’Currys and O’Mulleadys. However, after the final defeat by Cromwell in the 1600s there were huge confiscations of land and hardly any of the original Gaelic or Norman proprietors survived. Many emigrants from Westmeath made their way to Argentina in the nineteenth century, where their sheep-rearing skills were much valued (and hello to all of our Argentinian readers – we have quite a few!). We headed down through County Offaly on an Sunday morning with one destination in mind – Clonmacnoise! Do you know it? Have you been there? Neither Carina or myself had the opportunity to visit in the past – and we were ready! County Offaly was originally known as Kings County when it was first shired. It was only in 1922 that it assumed the name Offaly or “Uí Failghe” – reflecting the Gaelic clan who inhabited these parts. Up to the 1600s, the powerful gaelic families in the area were the O’Carrolls, the O’Connors and the O’Molloys. At a beautiful position on the banks for the River Shannon you will find the monastic city of Clonmacnoise. For hundreds of years before the arrival of the Normans it was the greatest centre of learning in Europe. A place full of life, learning and pilgrimage. One of the things we noticed as we walked the site and it’s buildings are the imprints that the Gaelic Kings and chieftains of Ireland left on this area. You still hear them in the names of the various buildings: MacCarthy’s Tower, Temple Connor, O’Rourkes tower, Temple Kelly and so on. It also holds the remains of the last High King of Ireland – Rory O’Connor – reminding us of a time when Ireland was a number of smaller kingdoms – brought together under one High King. If you want to experience a place where you can feel and reach into Irelands ancient past – Clonmacnoise is the place to come. Is your family surname here? It’s a long way to Tipperary! But when you get there – it’s well worth the journey. Tipperary is a land of mountains, plains, lakes, rivers and wonderful farmland. This last point made it very attractive to the native Irish and the invading Normans and English. Before the Norman invasion, the county was divided into the kingdom of Thomond (dominated by the O’Briens) and the kingdom of Desmond (dominated by the MacCarthys). The county was the front line of many battles between the two, ending only with the McCarthys being pushed from Tipperary into Cork. For most of this period Cashel, in the south of the county, was the seat of the kings of Munster. With the coming of the Normans – the Butler family made inroads into the north of Tipperary pushing the O’Briens further west into their original stronghold of Clare.The county was created and named after the town of Tipperary in 1328, making it one of the oldest of the Irish counties. As we travelled down the middle of Tipperary – passing through the historical sites of Roscrea, Thurles, Cashel, HolyAbbey – the land felt like it might have felt for thousands of years. We were off the beaten track and travelling where you will find no tour buses. Indeed, part of our route was the “Slighe Dhala” – one of the 5 ancient roads that travelled from west Munster to the sacred site of Tara. We ended our trip through Tipperary travelling through the wonderful medieval town of Cahir – with it’s incredible O’Brien castle – and then made our way across the county bounds back into the county in which we live – Cork – the start of our journey. An that concludes our roadtrip around 16 counties of Ireland as we cross the border from Tipperary back into Cork – our starting point. Remember – I’d love to hear your comments and questions in the comments section below. So nice to finally see the CONATY name officially in the County I traced it to. Thanks so much. I am having a hard time keeping up with you. Hi Bettie – no problem – you don’t have to keep up, just go with the flow! Mike. So excited to finally see our name listed! Thank you!! Have you heard of any McAbee? Yes and do check out johngrenham.com for more. My paternal grandfather’s family name is Carroll. I’m not exactly sure where my Carroll ancestors came from, all our records just say Ireland. Visited Offaly to check it out and the farmhouse we stayed in was owned by a Dennis Carroll which was my grandpa’s name, my father’s name, my brother’s name and my great great grandfather’s name. Thanks for sharing with us on The Letter from Ireland. But I think you may mean Cavan. Thanks for sending in your Family names. Carina. McElroy, O’Reilly, Clark, Carrol… I’ve traced my McElroys to Enniskeen in Cavan, but have gotten a bit stuck. Sounds like I’d probably finds lots of others in Cavan too!